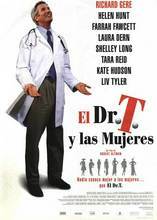 A successful Dallas gynecologist's desirable life crumbles after his wife suffers a nervous breakdown. Sullivan Travis -- known as "Dr. T" to his friends and patients -- is a handsome and gynecologist enjoying a clientele that includes some of Dallas's wealthiest women. Loving wife Kate suffers a nervous breakdown in the middle of a shopping trip one unfortunate day, starting a small fire threatening to set Sullivan's world ablaze as his unhinged family jump into the picture while professional golfer Bree takes a swing at his affections.